I have never felt the desire to learn how to knit. This obsession with knitting came on quite suddenly. Here’s the story of how my obsession came about. Last November, while I was sitting next to Mom’s bed in her hospice room, I often wrapped a long, soft and comfy prayer shawl around my shoulders. I had found it on Mom’s chair at home, and I brought it to hospice to comfort her. In the end, it comforted me during those long hours. After Mom’s funeral, I found a different prayer shawl in her room, and asked my Dad if I could bring it home with me. It has a triangular shape, and is knitted from soft, fuchsia yarn. Dad didn’t know who had knitted it, but I brought it home with me anyway. Having it draped over my shoulders reminds me of Mom. As I’ve held the fuchsia prayer shawl, I’ve wondered: Who made this for Mom? Did they say prayers for Mom as they were knitting it? Mom wasn’t a lifelong knitter; she learned how to knit as a teenager, and she took up knitting again only in the last few years of her life. She would knit small, warm hats to give to preemies in the hospital. She knit prayer shawls to give to women who needed comfort. While knitting a prayer shawl, Mom would say prayers for the special person the shawl would go to. Somehow, when when we were visiting my Dad for Christmas, I got it into my head that I wanted to learn how to knit. It would be a special connection to Mom. So I asked Dad if I could bring her knitting things to my house. I signed up for a knitting class at the library. It was a one-night class; not a big commitment. But the class was full. I was eighth on the waiting list, so I assumed I would never get in. The day of the class, a librarian called. There was room for me to come! I opened Mom’s knitting bag, and searched for the supplies that I needed. As I was looking through her yarn, I spotted a small ball of soft, fuchsia yarn. It didn’t dawn on me for a few minutes…then I realized…Mom must have knit the fuchsia prayer shawl! (I was browsing through your BF community discussions and came across this post:)I've never heard of a prayer shawl until now- what a beautiful idea, and how wonderful that you have the one your mom made!Both of my grandmas have attempted to teach me how to knit and crochet when I was younger, but it never caught on…sigh. I wish I knew how! What a great connection to your mom! I think you're going to LOVE the knitting class. My grandma crocheted but I could never pick it up. That's wonderful that you're learning how to knit, especially because it's something that your mother obviously enjoyed. I can't wait to read the rest of the story! Oh my gosh. This made me cry. 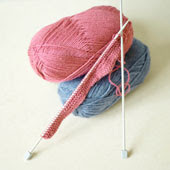 I'll be following along with you as you learn to knit and share your stories! My prayers are with you for the loss of your mom. I can't even begin to imagine how special that prayer shawl is to you. What a sweet, touching story. I can literally see the fuchsia prayer shawl. It sounds so warm and comforting. I can't wait to hear the rest of the story. How wonderful to think your mom knit that one. I have my grandmother's knitting stuff, and though I don't use it much because she knit on much smaller needles than I usually do (can you say, "much more patient than I am! "), I love it when I do use it. Good luck with the class. I learned to knit at Princeton, and I come back to it at times of stress (e.g., the beginning of my hearing loss a few years ago and the process of figuring out that diagnosis). It's wonderfully therapeutic. I hope you find it so this year. That is so beautiful that she made it. I love that you want to learn to knit. I think that would be fun, I learned in HS and did several things but haven't done it in years … like 35! I wish you great success.